There is no harder cigar to find from the Fuentes than the 8-5-8 Rosado. They are prized as collector’s items, so I was interested in seeing how such a rare cigar actually tasted. The appearance of this cigar doesn’t suggest anything special. The reddish tint and few veins make it attractive, but it really doesn’t jump out at you. After lighting it and taking the first puff, all I can say is “Holy crap!”. What a rich robust flavor! Smooth and creamy, teeming with leather and a bit of spice, the first puffs are a dream. The finish is really long, allowing me to enjoy these flavors long after the exhale. The stick is full flavored but not strong. However it does pick up halfway through. The same flavors are present but in greater intensity, making it a complex cigar, sort of. The last third is rife with espresso and cocoa notes with that purveying leather flavor. What a joy this was to smoke! It makes me understand why they are so heavily sought after. Dang!That review makes me want to offer my first born to the Cigar God so I can find AF 8-5-8! You make it sound so inviting and I love AF cigars anyway, but this reads like love at first puff! Will add to my list of “Cigar Things to Do”! Dammit! Now I have another rare Fuente I need to track down! Between OpusX, Anejo Sharks, God of Fire, Opus X Lost City, Don Carlos, etc al this company has a knack for making awesome hard to get smokes. Yeah Stephen, they wrote the book on how to create hype for a cigar. Personally most have them have underwhelmed me, this was a rare example of Fuente really delivering a great smoke. Are you sure you have the correct cigar? 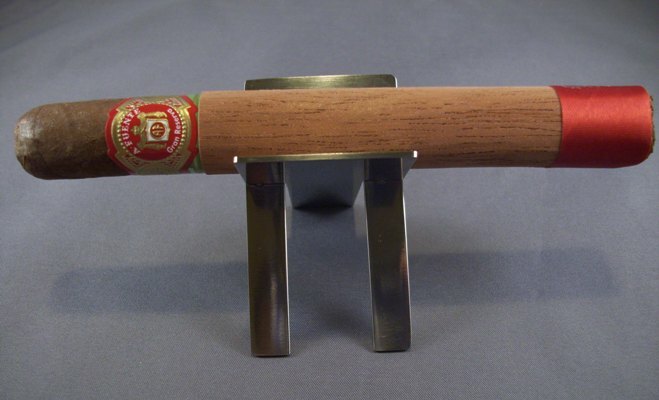 Given the measurements you posted, it sounds more like the new rosado line from Fuente called the Rosado Magnums, with the cigar you smoked being the R54. The 8-5-8 Rosado is 6×47-ish. Did the cigar have a white/red/gold band on it? If so, it’s the R54. Sorry, i use a review template. didn’t change the dimensions! What was reviewed was the Rosado pictured above. The Sungrown 858 had the “black” band not the green band but still has the cedar wrapped. The others (Natty, Maddy and Candela) are not cedar wrapped and can be differentiated by their color.